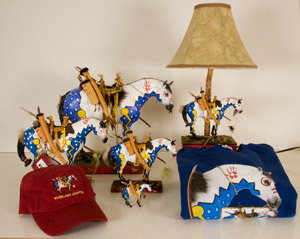 The Trail of Painted Ponies is one of the premier art and collectible companies in the world, crafting one of the most beloved collectibles in America, Trail of Painted Ponies figurines. These miniature works of art are prized by collectors who appreciate artistry and fine craftsmanship. Passionate about creativity and quality, The Trail of Painted Ponies is committed to crafting collectibles and companion merchandise that pays tribute to the beauty and majesty of the horse and the time honored tradition of storytelling. With this dedication to artfulness and integrity, The Trail continues to thoughtfully expand into new frontiers, building on the strength of the brand of The Trail of Painted Ponies while developing strong relationships with some of the best licensees in the world. The Trail of Painted Ponies, Inc.